Alex MacDonald, senior conservation manager for Nature Canada, says Naturehood was designed to reach urban Canadians and expose them to the nature all around them. A majority of Canadians, 81 per cent, live in urban areas, MacDonald continued. The Naturehood program has four main themes, he said: education, protection, monitoring and celebration. Education plays a large role, with programs in schools designed to get children out into nature. Protection can involve stewardship activities and even activism to reduce local use of pesticides. Monitoring, MacDonald said, looks to citizen-led science and can be as easy as seasonal bird counts. Celebration, he continued, also is a big part of Naturehood. Nature Canada will work with FOSH to expand their All Buffleheads Day events in the fall. That’s a celebration of the return to the area of what has been called the most punctual sea duck in the world. “That’s a great natural phenomenon,” said MacDonald. Bob Peart, a member of FOSH and a Nature Canada board member, was instrumental in getting Naturehood to the Saanich Peninsula. Peart said Nature Canada, in partnership with Mountain Equipment Co-Op, will provide the local group with $5,000. He said they plan to use the money to hire someone part-time to help build up FOSH’s profile, increase its budget and expand All Buffleheads Day in October. MacDonald added the event, scheduled for Oct. 15, will grow and will engage more youth in education about the migration habits of the Bufflehead and other birds in the sanctuary. “It’s all about inspiring that next generation about nature,” said MacDonald. 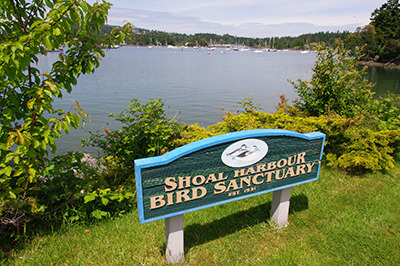 FOSH has been working to increase the profile of the SHOAL Harbour migratory bird sanctuary. “The area is part of a bigger migratory picture,” Peart said, “including Victoria’s Inner Harbour and the Esquimalt Lagoon. Peart said FOSH was told Naturehood was coming to Sidney a month ago. They were also informed that Nature Canada’s board will be coming to town in September for the annual general meeting and to show its support for Naturehood’s growth and their participation in All Buffleheads Day. Find out more about Nature Canada’s Naturehood program at naturecanada.ca.